Mix all the powders and clay together then add the apple cider vinegar. You will notice the mixture will fizz and bubble up, that is normal. Next pour in enough aloe vera juice or water and stir until a liquid consistency is achieved. Add a quick squirt of honey and stir well again. From here you have options. You can add the mix to a 16 oz applicator bottle and apply it to your scalp to massage it in or you can keep it in the small bowl and dump it over your head in sections and massage it in. I pick either or whenever the mood hits me, lately I like putting it in an applicator bottle better. From there after you felt that you've massaged it in enough, rinse your hair VERY well. 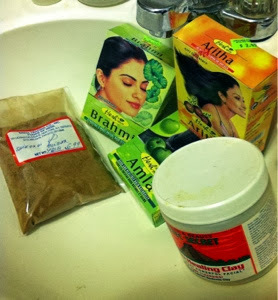 I found that the ayurvedic powders are gritty so you want to make sure you rinse them out really well or your hair will airdry with the bits still in your hair! They don't do any damage but it will look like dark flakes coming from your head if you don't and that's no bueno. In fact, if you want to follow up with a light conditioner or cheapie conditioner after rinsing, that will help give the grit something to bind to and remove any remaining. 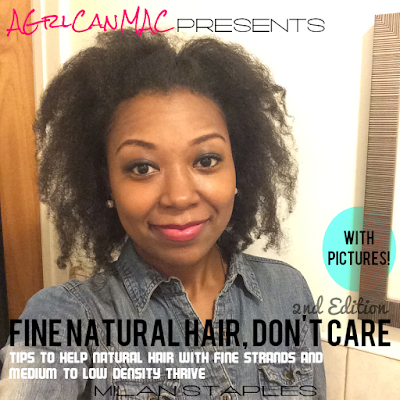 From there you then do what you normally do after cleansing your hair. I normally condition my hair before I cleanse it so that I'm able to detangle but if you condition after you cleanse your hair then do that. Whatever works for you, there are no rule with this mud wash. Please keep in mind your hair length. My hair is about BSL-MBL length when stretched. So if your hair is longer or shorter than mine, you will want to adjust the recipe accordingly. Please also keep in mind what kind of products have been in your hair. This mud wash works best for hair that not a lot of heavy products have been applied between washes. If you like using heavy stylers, butters or products with a lot of synthetic ingredients frequently, you may find that this wash isn't up to snuff for you. CAUTION: Because this recipe involves water, this doesn't store well over long periods of time. I honestly wouldn't try to store this but if you're adventurous, I'd store any leftovers in a closed container in the fridge and if you can't use up any leftovers in a couple days or so, I'd toss and make a new batch for the next time but you can use your own judgement. Homemade things that involve water and are preservative free spoil much faster because, well, that's what natural things are supposed to do! Things are supposed to go bad after a while, ya know, that's natural. lol.